The ss Brest was a 1472 ton Cunard cargo ship. It ran aground in dense fog near Beast Point in 1879. It had been dived in the past, how recently we didn’t know. So, it wasn’t new, just new to us. We were asked if we could help free a mussel rope by a recreational fisherman from Cadgwith, it had become entangled, others had tried to release it and failed. The fisherman had been talking with Dave, when they said it was next to the Brest, Dave offered our help. Before we headed down, we thought we would do some research on the wreck and it’s location. What we found wasn’t what we expected, for such a recent wreck. Beast Point is an old name for Bass Point, which lies just to the east of Lizard Point. The board of trade report usually has very accurate details of the sinking and the location, for some reason there is very little locational information within the report. The Hydrographic Office co-ordinates were listed as ‘Unreliable‘, making it near Kilcobben Cove, about one mile from Cadgwith. Another report stated it was wrecked near Polbarrow, which is half a mile from Cadgwith. A newspaper dated September 08, 1879 also listed the wrecks as striking the rocks at Polberro Point. Another paper stated that the Brest ran ashore between Church Cove and Polberro. The fishermen said it was on Whale Rock, the Hydrographic Chart has Whale Rock 0.8 miles from Cadgwith. Looking at older ordnance survey maps of the area, Whale rock is 200 yards closer to Cadgwith than the hydrographic chart shows. 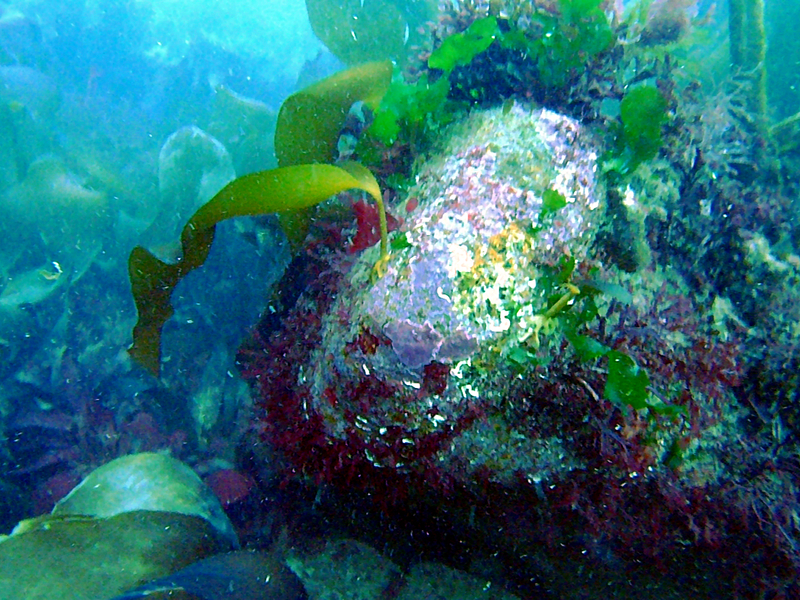 Dive reports listed a few scattered plates or a cave with encrusted material in it. Where were the fishermen going to take us? What would we see? We headed out on their boat, to where the old charts listed Whale Rock. There were two buoys floating, that was the top of their mussel line. We jumped in with a line to tie to the anchors, then were to cut the mussel line free. The anchors were a mess, I tied the rope to them and cut off the main mussel line, job done. Now to look for the Brest. The fishermen told us to head straight towards Whale Rock, we had taken a bearing and headed along the reef. It wasn’t long before we saw a few ribs, then a few scattered plates. As we searched we found more and more, including an area where the decks had collapsed on each other, a large piece of the hull and even the remains of the bow. What we saw was more than the scattered plates that had been previously reported. There was also no sign of a cave. Were those reports of this location? Or were they of the hydrographic office’s location? Or the Whale Rock as on the hydrographic chart? We shall return and look at those locations as well, just in case.